Insulin is a hormone that helps to regulate blood sugar. 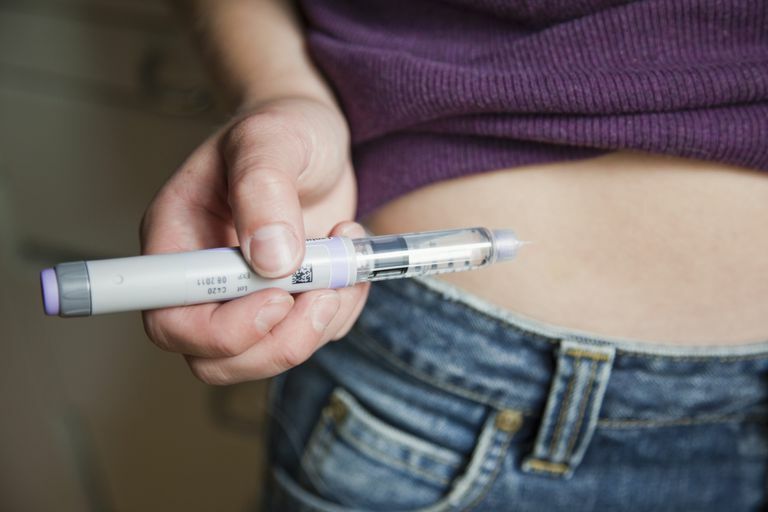 People with diabetes may need to inject insulin if their pancreas lacks the ability to make it, when their body is making inadequate amounts, or when they are unable to use their own insulin efficiently. If you currently take insulin or are about to start, it's important to understand best practices for injecting insulin. Understanding the properties of insulin injection sites and the importance of site rotation may prevent skin damage and improve blood sugar control by helping you to utilize insulin more effectively, while preventing high and low blood sugar. Insulin is meant to be injected subcutaneously (under the skin) into fatty tissue, such as the abdomen, outter parts of thighs, backs of arms, and buttocks. Injecting insulin into fatty tissue helps the body to absorb insulin slowly and predictably. This layer of skin sits on top of the muscle and has less nerves, which can make injections more comfortable. The amount of fat thickness is variable based on injection site, age, gender, and body mass index. Injecting insulin into the abdomen is very common amongst people with diabetes as there is a greater surface area as well as less muscle, making it more comfortable and easier to rotate injections sites. It is also easier to access, which makes it a more functional injection site. When injecting into the abdomen, you should avoid the belly button because the belly buttom is tougher and makes insulin absorption less consistent. Instead, inject insulin at least two finger lengths (or two inches) away from the belly button. Young children or people who are very thin or those who have very little body fat, may find the abdomen to be a difficult site to use because they can't pinch up a half-inch of fat. If you inject in the upper arm, do not inject into the shoulder. Instead, use only the outer back area (where the most fat is). If you have difficulty pinching the upper arm yourself, you can prop your upper arm against a wall or door to access the fatty tissue. Or you may have someone else help you with your injections. Upper buttocks or "love handles:" The upper buttocks has the thickest layer of fat, but can be hard to inject and rotate without some assistance. The "love handles" (that area just above your hip), can be a good injection site for young children or very thin adults as you are usually able to squeeze a small amount of fat. If you are injecting into the thighs, use the outer, fattier part of the thigh and avoid the inner thighs. If you inject into your inner thigh and your thighs rub together when you walk, it can make the injection site sore. Addtionally, it's usually best to use the upper thigh, as the fat layer thins out the further down the leg. Avoid injecting close to the bony area above the knee. Injecting into the same exact spot on the same exact site over and over again can cause the skin to develop hard lumps or extra fat desposits. Not only are these lumps unpleasant looking, they can change the way insulin is absorbed and make it more difficult to control your blood sugar. Over time, the thickened skin may not have nerve endings anymore and as a result, shots may become painless. A painless injection seems positive, but this can be mean that the skin is becoming more damaged and therefore it is not a good sign. The best way to control blood sugar is to aim to use the same site at the same time of day daily and to rotate within that site. For example, if you take mealtime insulin, inject it daily into your abdomen for breakfast, but rotate within that site daily. And if you take long acting insulin at night, you can use your thigh, for example, but rotate within that site. The best place to inject insulin will depend on what type of insulin you are using and when you are using it. Your body absorbs insulin differently depending on where it is injected. Typically, insulin absorption is fastest in the abdomen, somewhat less quickly in the upper arms, slower in the thighs, and slowest in the buttocks. Usually it is recommended to deliver mealtime injections in your abdomen, as they work fastest when you inject them which helps to lower post prandial (after meal) blood sugars. Remember that you will have the most consistent blood sugar results if you inject insulin in the same general area at the same time of day, but change the exact site each time. And long acting insulin, such as lantus or toujeo, can be injected into a slower absorption spot, such as the buttocks or upper thigh. If you plan to exercise after injecting insulin, aim to avoid the area you are about to exert the most energy from. For example, if you plan on doing a lower body workout, avoid using your thighs. Or if you are playing a game of tennis, avoid the arms, as this will increase the absorption rate and increase your risk of hypoglycemia. Fast absorption of mealtime carbohydrates is typically important to reduce after meal blood sugars, therefore, unless instructed otherwise by your doctor, or if you have an increased risk of low blood sugar or reactive hypoglycemia, it's probably smart to inject your breakfast and lunch, and maybe dinner (depending on post dinner sugars and activity level) bolus doses into the abdomen. What is not advised is to inject your breakfast insulin in the abdomen one day and into the thigh the next day. If possible, be consistent within each site and rotate accordingly. Long-acting or bedtime insulin could be injected into the thigh, buttocks, or upper arm so that the absorption can happen gradually, covering your insulin needs throughout the night. Ultimately, what's most important is that you have access to a site and are consistent. The choice is always yours. If you develop lumps and bumps at injection sites, avoid the area of the bump for several months because that area will absorb insulin differently and this can affect your blood sugar levels. In addition, avoid sites that you plan on exercising, as this can increase the risk of hypoglycemia due to increased absorption. Lastly, avoid injecting into moles or scar tissue as these can also affect insulin absorption. You'll know if you need to start rotating sites if your skin changes, you no longer feel the injections, and your blood sugars begin to rise. The skin may appear to develop a "grape like" lump or bump, which is known as lipo or insulinhypertrophy. It may be caused overtime by the in natural effects of insulin (one of which is to cause fat to grow) or by reuse of needles. To prevent further development of hypertrophy, rotate injection sites and don't reuse needles. If you see a dip in the skin that has a firm texture, you may have a condition called fat atrophy which typically occurs when using impure insulin. A hard lump can appear after using an injection site repeatedly. This condition, referred to as, lipodystrophy, is considered a scarring of the fat. A bruised area should be avoided until it goes away. If you have a lump under the skin immediately after an injection, it could be that you didn't get the needle all the way into your fat tissue and the insulin was injected just under the skin. You may need to practice your injection technique or possibly use a longer needle. Appearance of red, irritated lumps or a rash at the injection site, should be discusses with your doctor, as this can be a sign of infection. You may have to change sites while the infection is being treated and cleared up. A great way to rotate sites and keep track of where you injected last is to set up a cycle. You can start from left-to-right or follow the pattern of a clock, giving yourself a 12 day cycle. Using a 12 day cycle gives sites about 24 days to recover before being used again. Make sure to move a few inches from your last site. You may also want to download an insulin injection chart and make note of the areas you are using so that you can keep track and rotate accordingly. "Insulin Injection Sites." Health Information. 04 APR 2004. University of Wisconsin Hospitals and Clinics Authority. 27 Sep 2007. American Diabetes Association. Insulin Routines. BD. Step-by-Step Patient Injection Guide. Insulin: Who Needs It and Who Doesn't? What is a Bolus Dose of Insulin? How Do Different Types of Insulin Work?